Bright and beautifully colored Tie and Dye Turbans of the men folk! Vibrant and pretty colors of the attire of the women folk! Richly adorned elephants and camels found in and around the state! Rajasthan is definitely the most colorful land of India. It is a magical land that springs surprises at every turn, takes your breath away in every bend. Incredible forts, palatial palaces, exotic wildlife sanctuaries & national parks, historic cities, grand Havelis, magnificent shrines, traditional villages, desert landscapes, antique temples, rippling sand dunes, lovely lakes, heritage & citadel hotels, etc. It is extensively applauded for its wealthy culture, exclusive custom, rich heritage and splendid past. Jaipur, pink city is the dazzling emblem of the royal Rajasthan tours. True to its name it is a colorful, vibrant and enchanting capital city. The mesmerizing city with its adoring charm takes you to an era of royalty and custom. Hawa Mahal, Nahargarh fort, Amber Fort, Jantar Mantar, Jal Mahal, etc are some of the popular monuments located in Jaipur. Udaipur is one of the most beautiful and romantic city of Rajasthan. It is also often referred to as the Kashmir of Rajasthan. It is also called the city of lakes and palaces because there are many lovely lakes and palaces in this city. Explore the beautiful tranquil lakes of Udaipur such as swaroop sagar lake, pichola lake, fateh sagar lake and Udai Sagar Lake it would provide you a delightful experience to cherish for a lifetime. Mount Abu is a world famous destination to explore known for its Dilwara Jain temples and natural beauty world over. It is located in the middle of the lush green forested hills on the highest peak in the Aravalli Range. It is also the summer capital of Rajasthan. Climate at Mount Abu is very cool and peaceful because of its rich vegetation covering the entire hillside that includes coniferous trees and flowering shrubs. 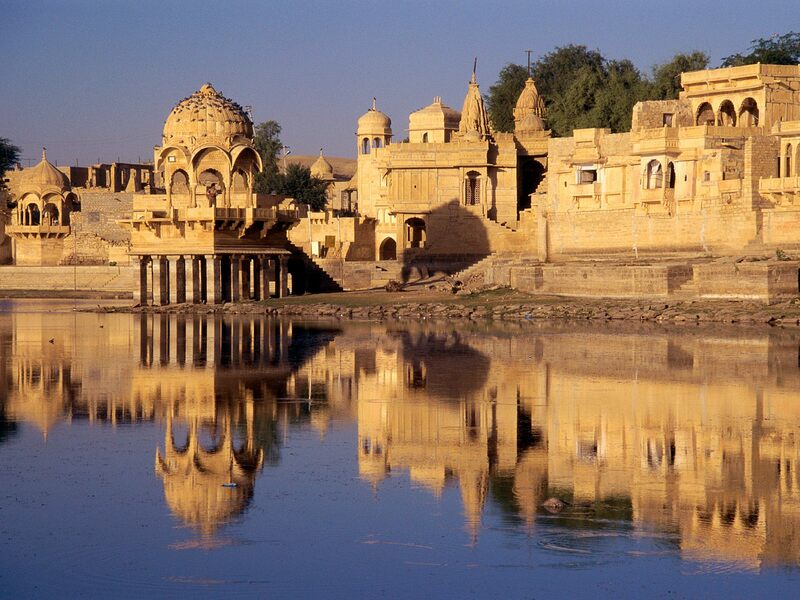 Jaisalmer, popularly known as the golden city of Rajasthan exhibits its traditions with Jaisalmer Fort. The town is situated on a ridge of yellowish sandstone, headed by a fort, which includes the palace and several ornate Jain temples. Jaisalmer is the quintessential desert town, its golden and sand-colored ramparts rising out of the arid Thar like a scene from the Arabian Nights. The exquisite sandstone architecture of the “Golden City” is quite unlike anything else in India. The city of Jodhpur endorses beautiful palaces, forts and temples that bring back an instance of the past. The folk dances, music and elegant handicrafts create an ambiance of a romantic city. Jodhpur is famous for historical monumental sites. Mehrangarh Fort and Umaid Bhawan Palace, etc are the prominent attractions in the city. In Rajasthan, you will feel like going in a time machine as all places have their own story to tell. Rajasthan is a land of contrasts. People are friendly, full of joy, color and bonhomie. Pamper your taste buds with the mouthwatering cuisine of the region. Every region has its own uniqueness be it from desert dishes to royal delicacies. So what are you waiting for? Go and spend some days in Rajasthan!